Crawling is one of the most important phases as it signals the baby is about to start walking. However, if left unwatched, your energetic baby may crawl inside or outside the room and make lead to the dangerous situation. To avoid such scenarios, it’s advisable to simply install a safety gate or walk-through gate. You are certain to get maximum satisfaction if you select a top product. This is why you need to look at the review on the best baby safety gates in 2019. 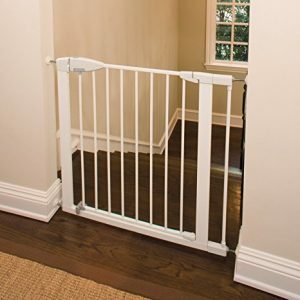 Material: baby proofing gates are constructed from metal, wood, plastic and other materials. Steel is among the sturdiest material, wood is liked for its elegance while plastic is preferred for its lightness and affordability. Evenflo not only caters to your baby needs, but also helps prevent damage to your house. The baby safe gate, has been constructed with non-marring rubber bumpers for that purpose. It has been designed to fit a variety of openings and is very easy to install. One of the things that make it a popular buy, is the fact that it fits in with a variety of decors. Designed to fit in spaces measuring from 38-60 inches wide and 27 inches tall. 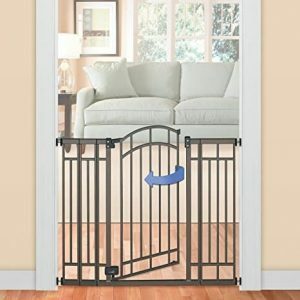 This metal gate by Munchkin is targeted at users who want their babies to be safe in the home. It measures 29.5 inches in height and can fit in openings whose width is between 29.5 and 35 inches. The pressure mounted baby gate features U-shaped power frame for rigidity and strength and is operated with one hand. It will lock shut with a simple push and comes with the double-locking system. Although functional, the quality of the latch could be better. The Regalo Extra walk-through safety gate can be installed within minutes without any tools or special skills. Once done, you won’t have to worry about your “bundle of joy” creeping in another room, going down the stairs, or having to constantly watch the baby. The metal walk-through safety gate can be fitted in doorways, staircases, hallways and wide openings. The width expands from 29 to 34 inches while the safety lock prevents accidental opening. This item would have earned more stars if the installation was much easier. 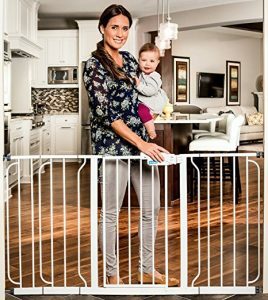 This multi-use gate by Summer Infant is certainly what you need to baby-proof your home. 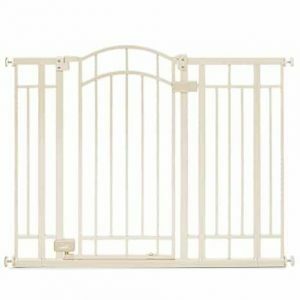 Made from high-quality beige-finished metal, the sturdy gate can put up well with lots of pressure and can be fitted in different kinds of spaces including the top of stairs. It is 36 inches high which is best fit for 6 months to 2 years old kids as well as small pets. The contemporary-styled and elegant gate is pressure mounted and comes with auto-close and dual locking. 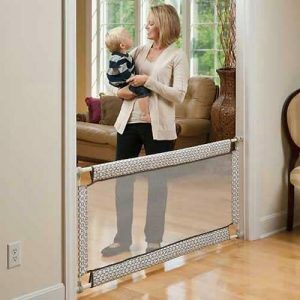 Prevent your baby from crawling or falling down the stairs by fitting the Cardinal Special Gate. It comes in friendly height of 29.5 inches and extendable width of 27-42.5 inches. The simple gate can be mounted at 30-degree angles and features stop bracket that prevents it from opening accidentally. For convenience and ease, this accessory is operated by one hand. Unfortunately, it isn’t very suitable for other spaces other than the staircase. 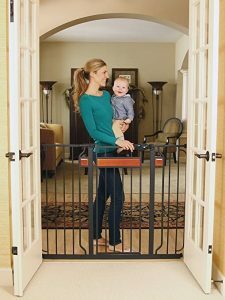 Fitting a gate to baby-proof your home is easier when using the Expansion gate from summer Infant. This 6 foot gate is made from metal for sturdiness and durability and is hardware-mounted for reliability and strength. 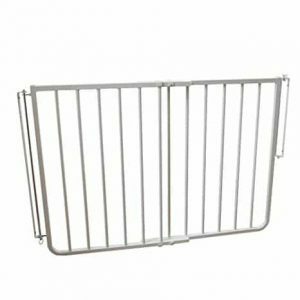 The gate’s height is round 36″ tall comes with 4 extensions and can fit is spaces that are between 44 and 72 inches wide. It is operated using one hand, comes with bronze finish and features a bottom rail guard for preventing scratches. The included instructions unfortunately aren’t very clear. The Regalo brand is among the top baby gate brands in the market. The manufacturer is renowned for making quality, reliable, stylish and durable products. This Walk Through gate is one of their favorites and is made from metal. It can be fitted in hallways, doorways, and top of staircases as long as the space is between 29 and 39 inches wide. Installing the unit is easy since its pressure mounted and comes with lever style handle. Although it fits in large spaces, the gate’s opening is somewhat small. The Regalo Home Accents gate will ensure your baby crawls within the set confines without your intervention. The stylish gate is made from a combination of metal and wood and is effective for a range of spaces including top of staircase, hallway and doorways. 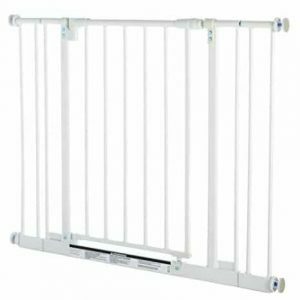 With a height of 38 inches and expandable width of between 29 and 44 inches, this pressure mounted baby gate is easy to fix. It comes with an easy close handle and will effortlessly close with a simple push. However, in its fully-extended form, this gate tends to wobbly slightly. This easy close metal gate by North States comes in adjustable width and can fit in spaces ranging from 29.5 and 38.5 inches wide and height of 30 inches. Made from heavy-duty metal, this accessory will remain firm whether installed on the doorway, hallway, or top of staircase. It comes with child-friendly design that will keep him/her confined with the desired spaces. The triple locking mechanism together with simple design makes opening and closing of the gate by adults easy. Unfortunately, the plastic components don’t feel as solid as the metal frame. Summer Infant’s Deco Extra Walk-Thru baby gate is our top choice. It’s crafted from bronze-finished premium metal and can be fitted on the staircase, doorway, hallways, etc. 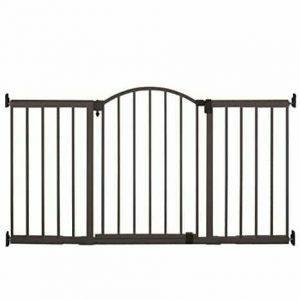 The trendy gate is 36″ tall and will fit 28-48″ wide openings. It is a multi-user gate and can be pressure mounted or hardware mounted. Also featured are auto-close door, dual locking and contemporary design. Some shoppers have asserted that this gate’s opening is relatively narrow. You don’t have to constantly keep an eye on your baby while he/she crawls all over the place, yet the baby still remain safe. 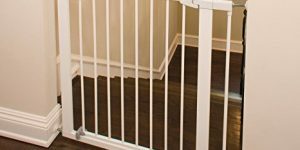 The best way to childproof your surrounding is investing in a safety gate. All the listed products are made from top materials, easy to install, come in varied shapes and sizes, and are also child-friendly. What model appeals to you best? Let us know in the comment below.